Here’s the thing: I have not been blogging enough lately. This little part of the internet has been in my thoughts so much these days, but I haven’t actually been writing and photographing and putting up here. It’s gotten a bit lost. I’ve been writing and photographing for other people. People like Edible Vancouver and the Vancouver Observer and HelloGiggles. But not here. And I’ve been baking a lot too, for Merchants Oyster Bar, which just got a great review in the Globe and Mail, and even if the woman reviewing it made it sound like the chef was making the pastries, it was me, and she said nice things. 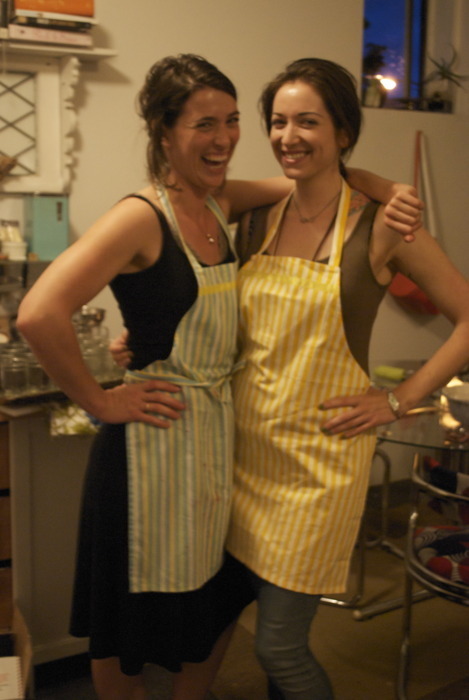 But mostly I’ve been baking for Livia Sweets the company. The super-exciting-can’t-contain-my-smile-when-I talk-about-it company that I own. That I make pastries for and sell. That people buy, and say nice things about on the internet. That fills me with so much joy I can barely handle it. I’ve also been working hard with a design team to get this website spick and span with a new look, updated pages, lots more pictures of myself (which I’m a bit self conscious of truthfully) and that’s much more user friendly. You can leave comments again now! I can update the recipe index! I can add pages about my exciting new projects! It’s a lot of big improvements. It’s been a very busy couple of months, the kind that knock you over sideways a bit and make you so exhausted that you end up getting strep throat that makes you cough so hard you have to take all sorts of herbs, and watch an entire season of Nashville in one week just get better. But now I’m feeling pretty good. I’m feeling pretty on top of things. And I’m going to ease you into a recipe with this one because it’s so painfully easy it feels like a cheat to give it to you, except you would all hate me if I didn’t because it’s so darn good. It’s crunchy and salty and spicy, but also earthy and sweet and exactly what I want in a bowl of pecans on my table. And also on my friends table because I’ve already been enlisted to bring her some after she saw my instagram picture of them only a few minutes ago. They are wonderful. And so are all of you, thank you for your patience these last few weeks. 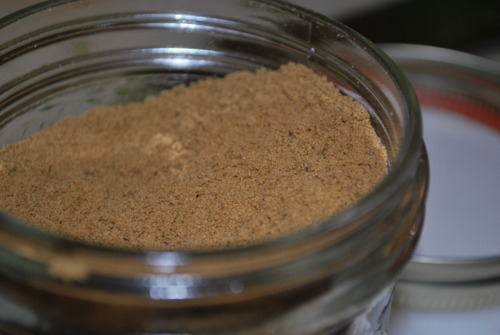 *If you think maple syrup is a bit indulgent, or you just don’t have any kicking around, you can easily substitute honey or brown rice syrup, and it was be nearly as delicious. 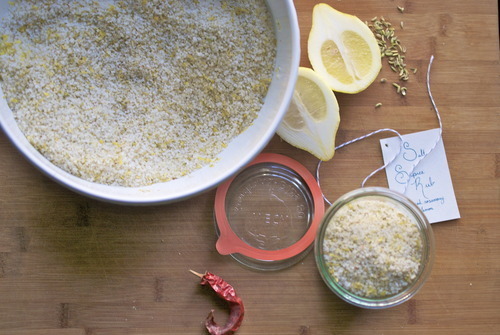 Mix together all the ingredients with your hands in a medium sized bowl and then sprinkle them out on the parchment lined tray and spread them out. Bake for about 20 minutes, stirring every 5 minutes. You’ll know they’re done when the sugar around them has stopped bubbling but instead looks crystallized onto the nuts. Cool, and try not to eat them all in 5 minutes. You know that moment the morning after a couple too many drinks when you first wake up, and realize that you forgot to put the cork in the bottle of red, that you opened much too late and drank only half a glass out of? And it’s sort of heart breaking that that lovely bottle that so many grapes died for is now just going to be thrown down the drain? And you think, well, maybe I opened it late enough and you put the cork back in it and hope for the best, but by the time you open it up the next day (lord knows you’re not trying anything boozy that night) it’s absolutely tragically off. I can’t be the only one who does that right? 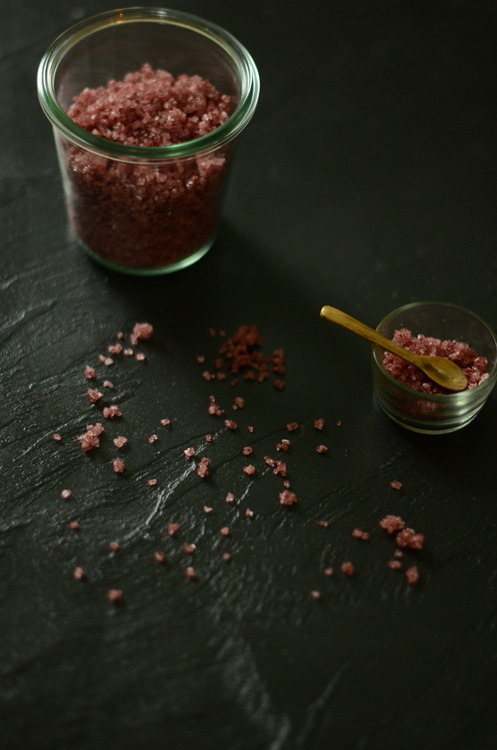 So recently a friend of mine suggested red wine salt as a solution, and my brain nearly exploded. There is a use for corked and terrible left over wine? How am I only just figuring this out? It’s a day full of questions. 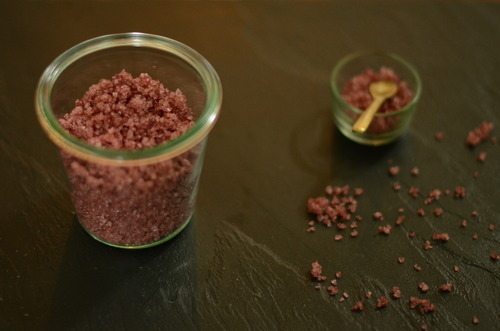 You take that wine, you reduce it down like crazy, and when it’s a thick syrup you stir in a whole bunch of coarse salt, and then you spread it on a tray and let it sit out overnight. And the next day, unlike the last when you woke up knowing that you’d ruined a bottle of wine, you wake up to something wonderful. Something that will instead add a bit of depth to your steak dishes, and gussy up a piece of duck, and look tres chic on your dinner table when you’re entertaining. Or bottle it up and give it as a hostess gift! Just don’t tell them that really, it’s just the cheapest salt around with an old bottle of wine. 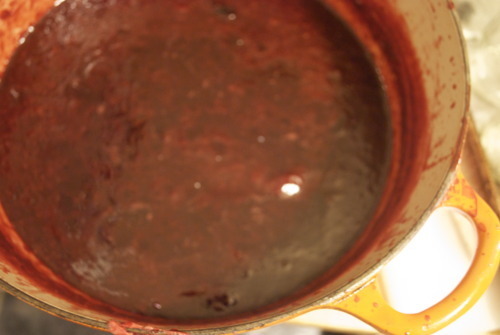 In a medium pot over medium heat reduce wine until it becomes a thick syrup. This will take about 30 minutes. 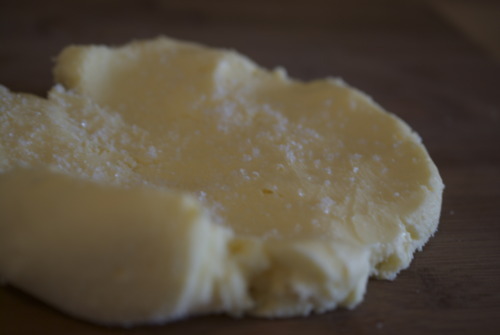 Mix together well and spread on a baking sheet lined with parchment paper. Allow to sit out overnight, or until very dry. I’m not sure why, but I’ve been thinking a lot about my trip to New York last year. Maybe it’s because it was this very date, last year, when we were there, or maybe it’s because I’ve been flipping through the pages of of the Ann St Studio blog lately and she has the most gorgeous pictures of that fabulous city. Or maybe, and mostly likely, it’s because I have felt like I haven’t left Vancouver in too long. I’m feeling wistful and dreaming about hoping on a plane to go somewhere, anywhere maybe. Thinking about it, I’ve realized that I’m often somewhere else in the fall. It might be my favourite time to travel. Not that I’m complaining or wining, I’m going to be in Seattle not once, but twice next week for workshops, and I think that will push this feeling out of my system. But in the interim, I’m going to sit here and think about New York. I’m going to imagine my next trip and plan it in my head and pretend I’m going to visit my sister and that we’ll go to galleries, and drink cocktails, and just hang out and catch up. In this dream she isn’t working full time and doing her MBA but would have time to show me her favourite spots and introduce me to her friends and let me see the life she’s building there. A life I would love to see. And I’m imagining going back to this wonderful little restaurant called Left Bank where I ate the most amazing chicken of my life last year. The chicken itself was nothing crazy, just roasted simply with some lemon and thyme, but the sauce was revelation. And also, possibly the most basic sauce I’ve ever had on a meal at a restaurant. 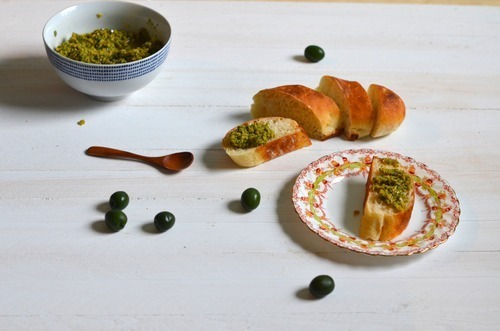 It was simply the most gorgeous bright green olives that were torn into small pieces and mixed with lemon and orange zest and bound in a very loose way with olive oil. But these olives. They were the best olives, and the orange was just this hint in the back that brightened the whole thing. There was absolutely nothing fussy about any of it, but it was perfect. 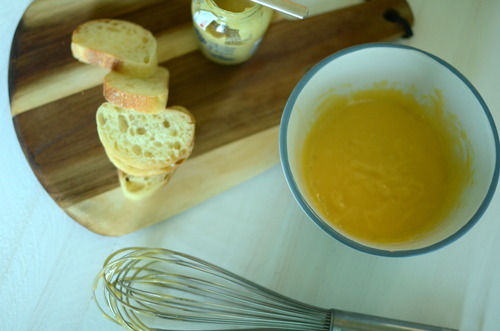 So I was thinking about this the other day when I was panning on having some friends over, and I made this sauce, only I made a great pile of it and we slathered it on baguettes and ate it with our wine. I’ve never had a tapanade with green olives but that’s basically what this was. With the left overs, I have dolloped it on top of poached eggs, put spread it on toast and made a chicken sandwich, served it along side pork. 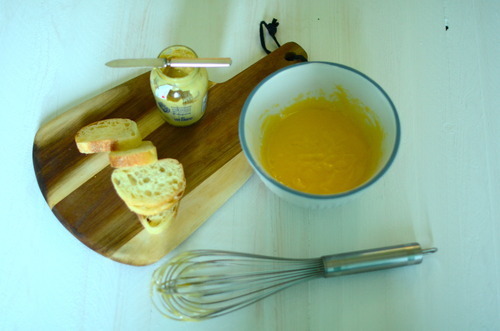 It’s just the most lovely sauce, that is both deeply savoury and a little bit fruity. 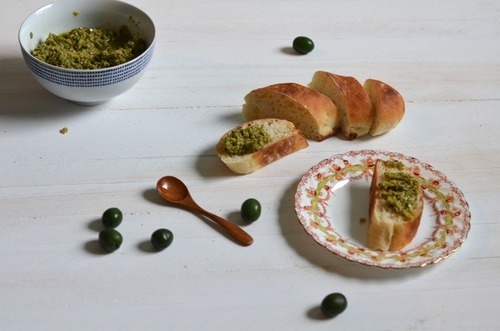 *do not bother making this with the canned green olives you get at the store, you will be disappointed. 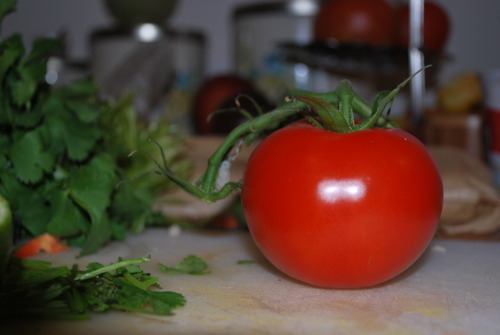 Instead go to an Italian grocer and try a couple different kinds. I like the dark green nocarella olives the best. 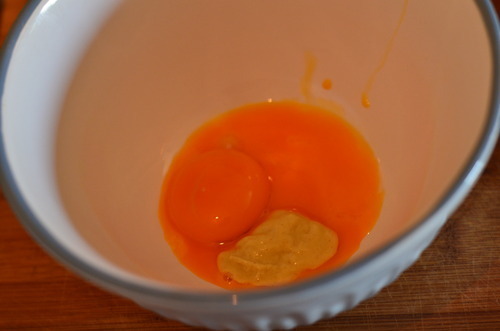 Put them in a food processor and zest the orange and half of the lemon in. Now cut the orange and squeeze in the juice of half. Add in half of the olive oil and pulse. You don’t want it to grind into a paste. You want a loose consistency. Taste. Does it need a bit more orange or lemon? Add it if you think it does. 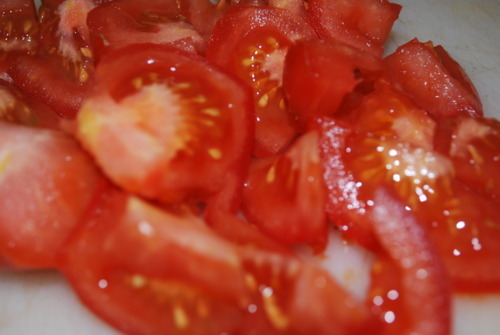 Now stir in the rest of the olive oil, put it in a bowl and serve! I relented and bought a new umbrella today. I thought that I wouldn’t need to replace my last lost one because it was May. Because the sun should be shining, and life should be swell but instead it rained all day. And all yesterday, and the day before that. There are these brief moments where the sun almost shines through the clouds and it’s almost like there isn’t a blanket of white and grey over us. And then the moment passes and the sun is completely invisble again. And I go back to day dreams of summer days and picnics on Wreck Beach and drinks on patios watching the sunset. 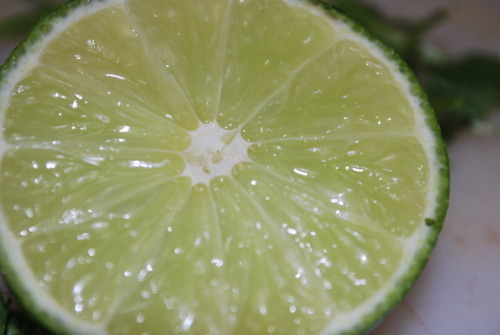 This is a recipe in preparation for those times, and it also makes use of one of the last reminants of the citrus season, the key lime. This makes an afternoon G & T into something glorious, this with a splash of vodka and some sparkling water is the perfect post work wind down drink. 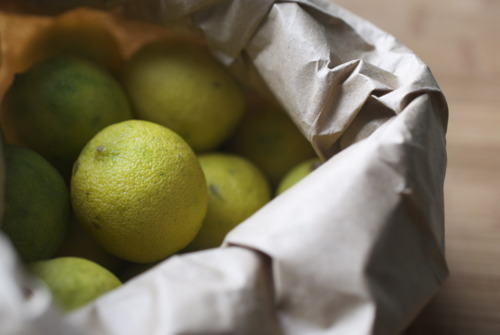 This means you never have to run out to the store to get lemons and limes before a party, because this is better. 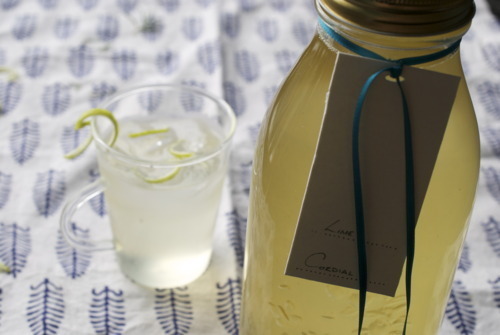 This is not the lime cordial you buy at the store with fruit juices from concentrate. This is so fresh you can hardly tell it wasn’t squeezed just for your drink. This you want in your house at all times. 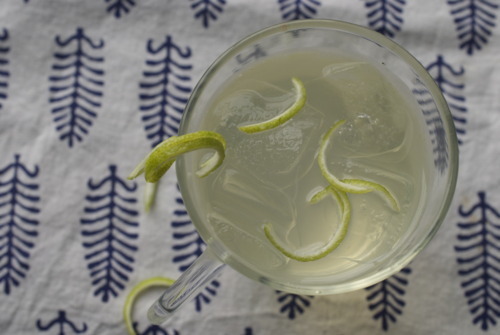 Adapted from the Lime Cordial recipe by Stephanie Alexander. 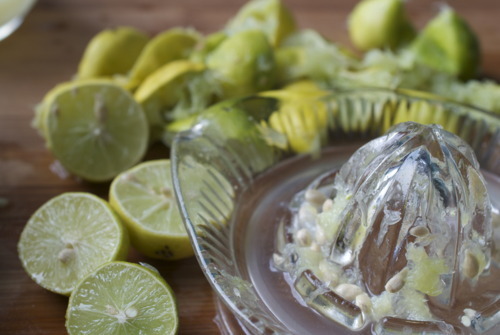 *You can make this with regular limes if you can’t find them of course, but there is a soft sweetness to a key lime that elevates this. I’ll admit that they take work, i had to squeeze 30 key limes but I also got over 2 litres of cordial, so that’s okay by me. **I bought both citric and tartaric acids at a gourmet shop near me, but you can also buy them both at make your own wine stores. Wash 2x 1L jars or bottles carefully then place them and their lids in the pot of water and sterelize them. In the meantime bring the water and sugar up to a boil. 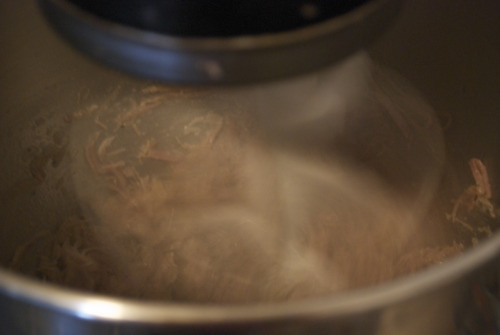 When the sugar has totally dissolved add in the acids, and bring back to a boil. Now add the juice and bring it back to a raging boil. As soon as it hits that mark, turn off the heat. Take the jars out of the water and set them straight on a clean counter. Pour in the cordial leaving a 1/4 inch of head space and put on the steralized lids. It can be tricky to judge how much to pour in because of the bubbles, if your unsure add a little extra. Allow to cool slowly at room temperature making sure the lids seal properly. This will keep for ages, and if you don’t feel like sealing the jars it will last a long time in the fridge with a screw cap. I think it’s fair to say that my friends consider me pretty domestic. I think maybe it’s fair to say that I am pretty domestic, except in the world of cleaning, although I swear I am getting way better. Honest. 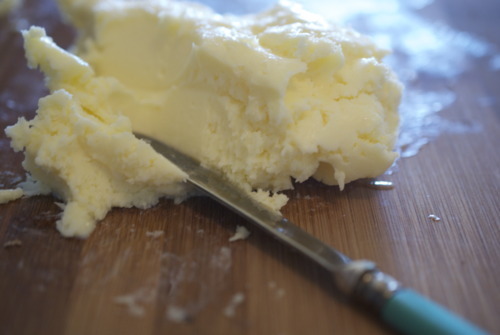 My girlfriends rarely complain when I show up at there houses with pies, or send them off to their boyfriends with scone dough to bake up in the mornings, but rarely do they come into the kitchen and help me out. So last week Jordan came home with 2 big flats of local strawberries and a few of my favourite girls came over to cook them down, sweeten them like crazy and put it all in jars to open in December when we’re jonesing for good fresh fruit. Some people know this process as jam. So the urban planner, the song writer and the jewelry maker came over and we listened to Lionel Ritchie, hulls strawberries, ate amazing take out Indian food (man oh man do I love Tandoori Palace) and we all walked away with a lot of jars. I don’t have a set recipe for jam, because every strawberry is different, and while jam has to be sweet because the sugar is a preservative and that’s how it keeps, I hate jams that taste like sugar. 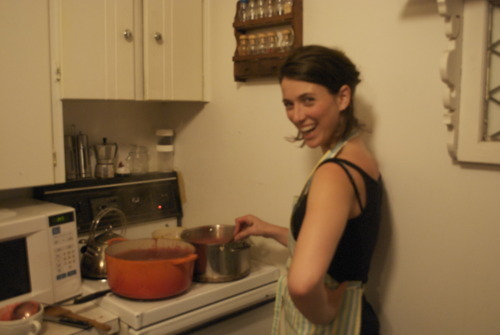 There are a few things that are imperative to jam making. Firstly, clean hands, clean jars, clean lids. Clean. 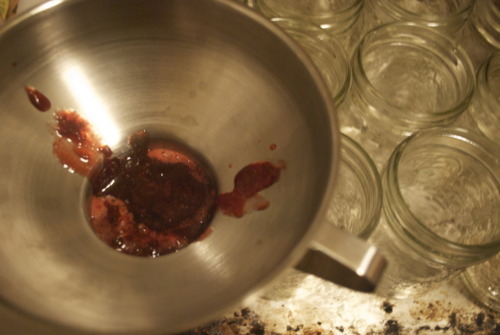 Bacteria getting inside a jar can become botulism, and that scares the hell out of me. Seriously. 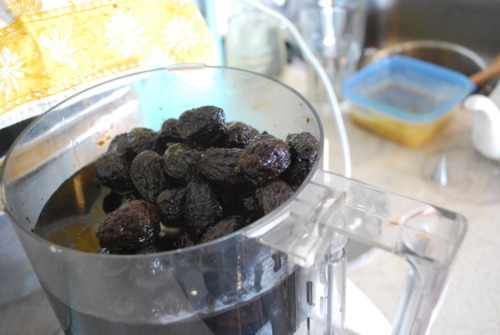 Secondly, in order to get a really fresh fruit taste, you have to do it in small batches. Just use two pots. You’ll do it in half the time, and you’ll be able to taste a huge difference. Thirdly, I say I don’t measure the sugar. The basic formula is 2 parts sugar to 1 part fruit, by weight (so two kilos of sugar for one kilo of fruit) but I find this excessive and so I use a little less. I also don’t boil the jars, I clean them very carefully and then I keep them hot in the oven, I find this method easier. Place a plate in the freezer. 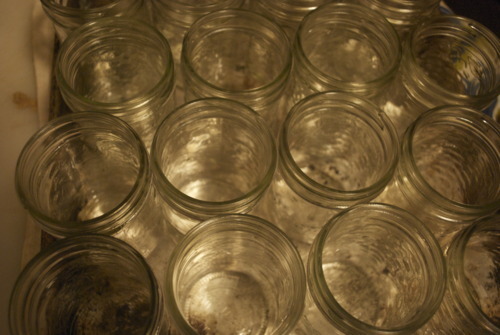 Wash your jars and lids very carefully, put them on a tray in single row and place them in the oven. Put them all into a big pot and cook them, stirring frequently, on medium heat until most of the liquid has been dissolved, about 20 minutes. 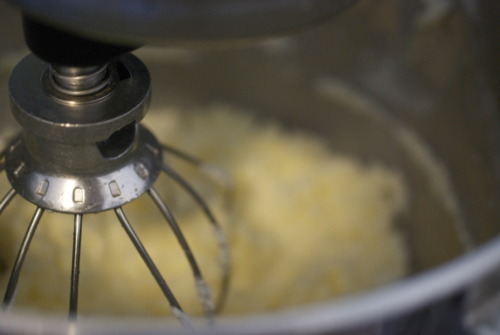 Add in 3 cups of sugar, lemon juice and the vanilla bean and cook until that has reduced. Now taste it. 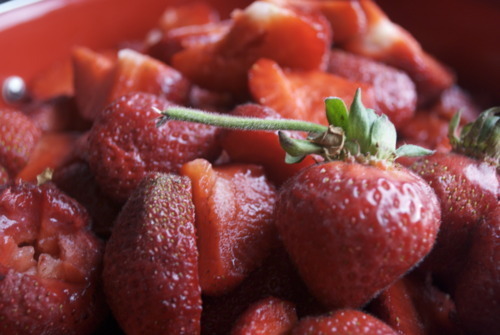 If your using really good fresh local strawberries you may find that it’s sweet enough as is, or if your strawberries were a little less ripe you may need to add more. Be careful at this point, the sugar is likely to burn if your not watchful and stirring pretty regularly. 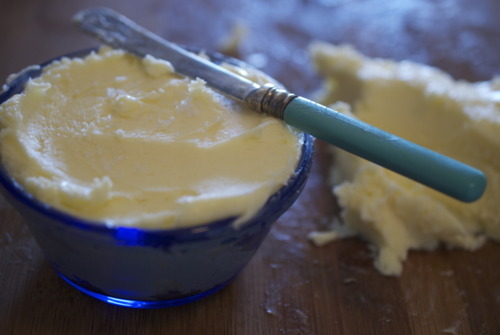 Now check the consistency- take the plate out of the freezer and spoon a little jam on top. Let it sit for a minute and then push it around. If it’s done it won’t spread thin and if you spread your finger through it it will hold it’s shape and not spread out again. If your there jam is done! If not keep it on for another 5 minutes or so and then try again. When your ready take out the jars and fill them up with about a quarter inch left from the top. 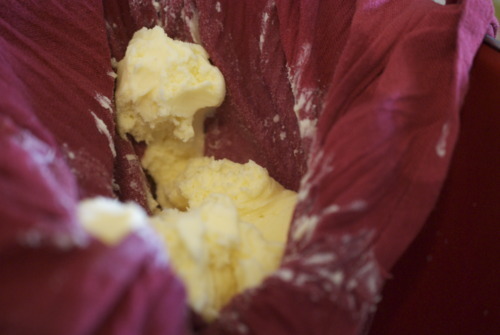 You can do this wth a ladle or, if you have one, a canning funnel is very helpful! Put the lids on and just barely screw them on. Put them back in the oven for 5 minutes. Take them out and let them cool at room temperature. You should hear popping noises as the jars seal. And your done, strawberry jam! After a pretty rough year I decided to skip town and get lost in Paris. Oh Paris. Words do not begin to describe how wonderful it is to get lost in Paris. To just forget about everything and emmerse yourself in drawing, painting, people watching, gallery hopping, coffee drinking and macaroon eating, is an extraordinary luxury and I am so grateful for it. However, I am not so luxurious to have gone and done it all in style, and so, to balance out my daily macaroon budget (4 euro a pop!) I ate completely delicious sandwiches that were both cheap and exceptionally tasty. The one I ate the most of and the one which you can’t find any where in Vancouver were big slabs of crusty baguette stuffed with pork rilette, cornichons and dijon mustard. 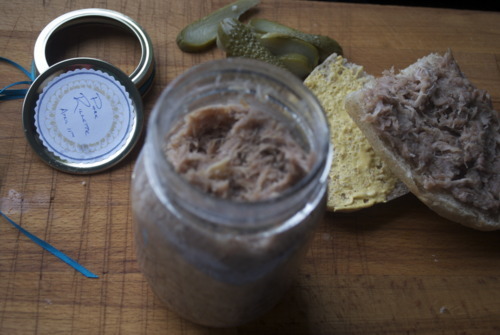 Pork rilette is basically pork thats salted and then braised in it’s own fat and shredded when it gets tender. This mix gets put into jars and will last, if done properly, for several years. But I certainly don’t have that kind of patience. 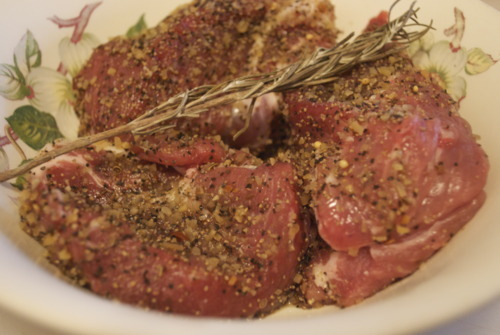 In a bowl mix the salt and the pork, let it sit for 2 hours, at room temp, or overnight in the fridge. In a culender rinse off the pork. 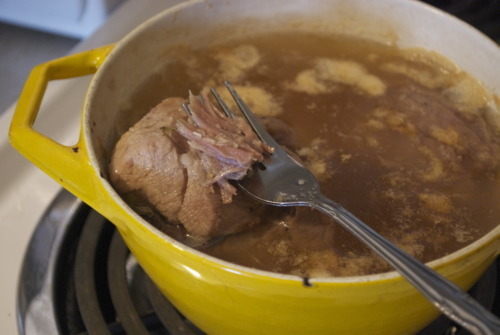 In a small pot put the pork, the fat and the thyme and bring to a boil. 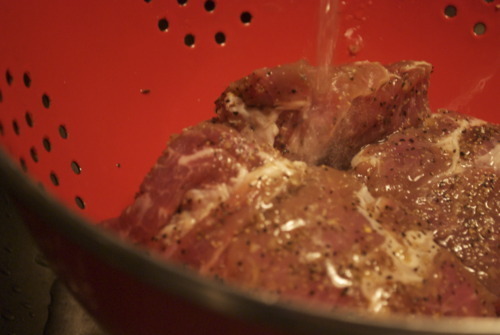 Immediately bring down the heat and let it stay at a bare simmer for a couple hours until the pork is fork tender. If you let it sit overnight it will get to soft so I don’t recomend that. 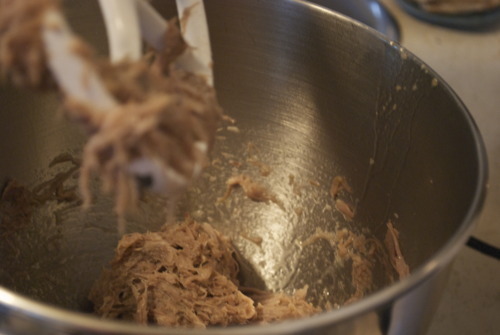 Either by hand or in a kitchenaid fitted with the paddle attachment shred the pork until its seperated into tiny string like peices. 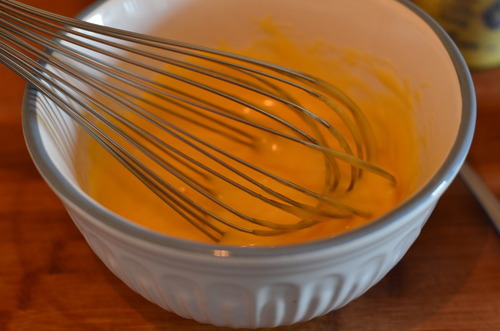 Add in a couple tablespoons of fat until it comes to a thick consistency. 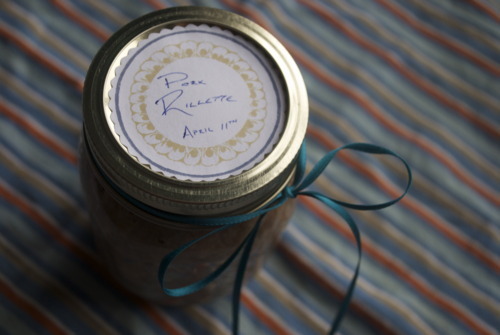 Put into a jar, or eat it write away! depending on your patience! So your going to have some people over for dinner. Your going to try to impress them, make a nice meal, maybe braise some lamb and saute some good veggies from your local market. 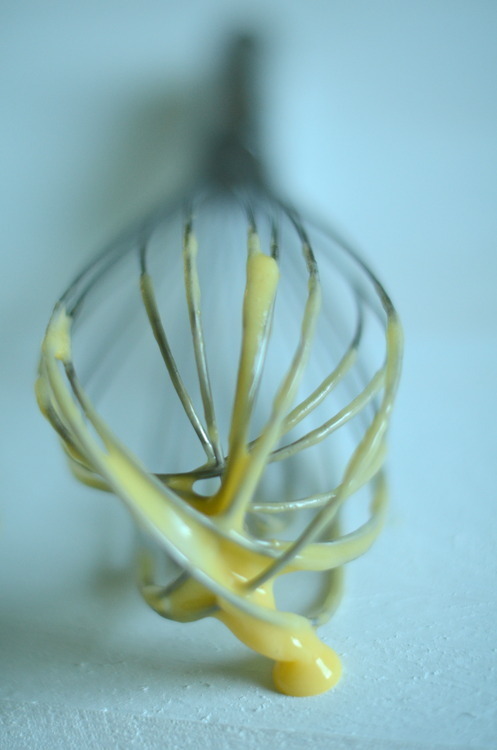 Maybe your going to make a tart or a cake. Your going to put some effort in. So you go to the store because you forgot that you need to buy some cheese for the cheese and meat plate that you’ll put out while you drink your glass of wine and great your guests. You need to buy some of that fancy jam that costs $8.00 for 250mL to put out on your cheese plate and then you buy some expensive balsamic to dress the salad. Your finishing touches just cost you $25.00. But that won’t happen to you! Because you’re reading this post which means you now know that all you need are some dried figs and some really cheap balsamic. I spend $6.50 on a liter of balsamic. Buy the crappy stuff. 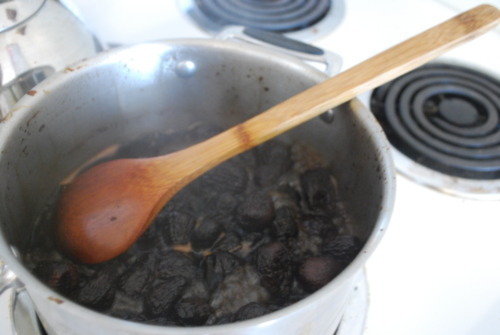 Buy some decent figs, black mission figs if you can find them, and you’ll take them home simmer them for a couple hours and you’ll have really good balsamic. 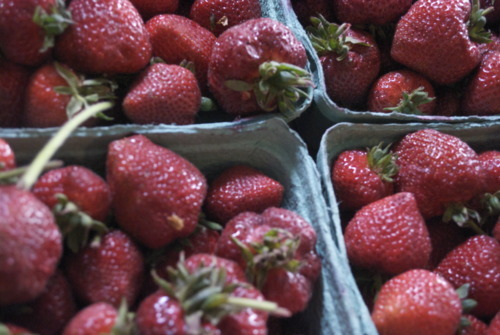 It will be sweet, it will be fruity and it will taste like the good stuff. 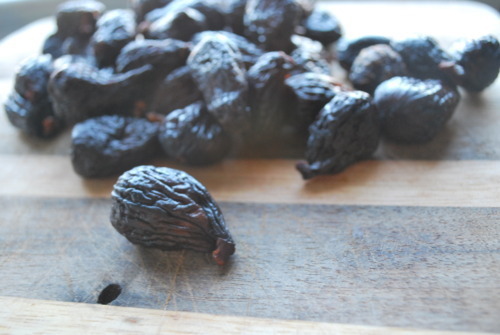 And the figs that have been poaching away with them will be transformed into a beautiful jam for your cheese plate. You’ll mix in some honey, maybe some vanilla, maybe some rosemary, maybe both if you have them on hand and you’ll through it in your food processor and out comes fancy homemade fig and balsamic jam. Not bad for 10 minutes of work and less then ten dollars! 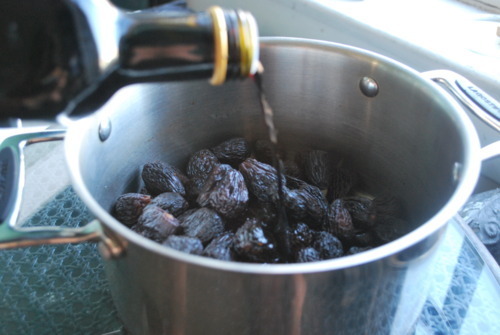 Cut the woody end of the figs off and pour into a heavy bottomed pot with the vinegar. Do not use an aluminium pot or your vinegary will taste like aluminium. 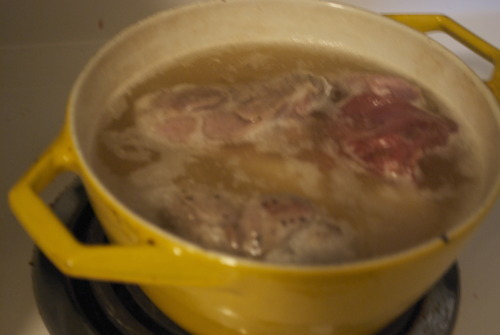 Simmer for about 2-3 hours. Strain it, you now have your vinegar. That was easy right? Once figs are hot put them in your food processor and puree until smooth, add in the vanilla and the rosemary and pulse to combine. 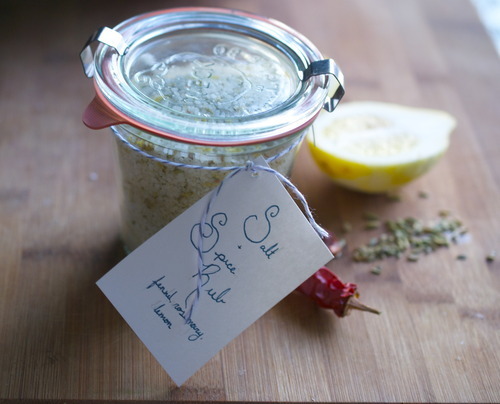 Put in a jar and it’s ready to serve! The Pioneer Woman and I are two very different people. She’s married, has 2 kids, 3 books, a ranch, and clearly an amazing career built on her ability to relate to people. People like me even. Me, who has a lovely, but crappy apartment, lives in a city, no kids to speak of yet and certainly no book deal. What, you might ask can we relate about? I’ll tell you friends. Salsa. 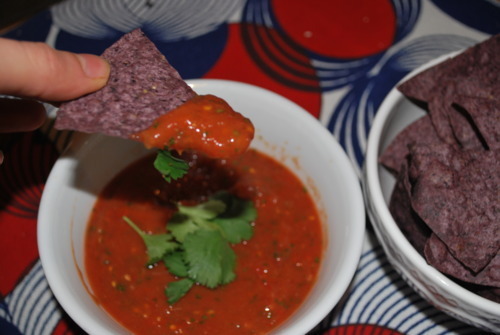 The Pioneer Woman has some strong feelings about salsa. Feelings I didn’t even realize I had until I read her recipe and realized she was completely right. I like my salsa diced up finely. Very finely in fact. 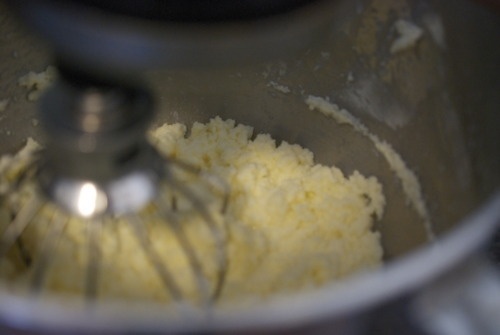 So fine that its best to use a food processor. I’m not being lazy, I like that consistency. I also hate vinegar in my salsa. When you need some acidity, use lime juice! Lime juice is delicious. And I usually want more cilantro then anyone I know in most things and this is true of salsa too. Bring it on cilantro. I did change a couple things, it’s true. Mostly because I couldn’t find the canned tomato/jalapeno stuff she uses. I used less jalapeno, Jordan wishes it was spicier but I don’t. 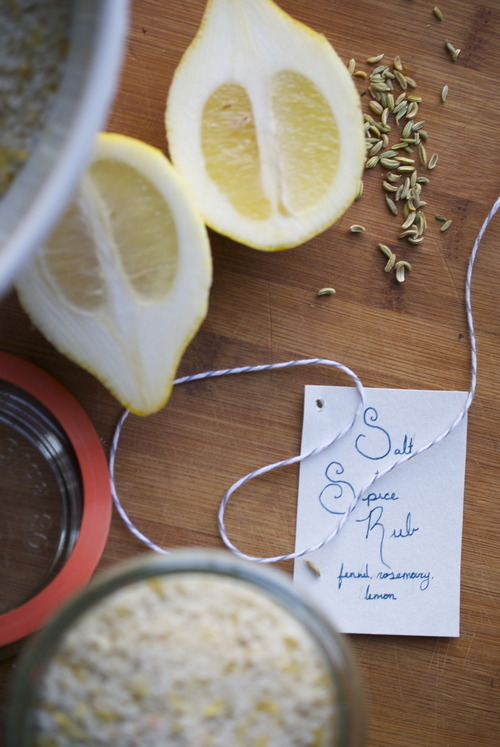 I used a little more cumin, but maybe my cumin is just old, and that’s why I needed more. And I added more lime juice. Just because I like more lime juice. So there you have it. The Pioneer Woman knows whats up. 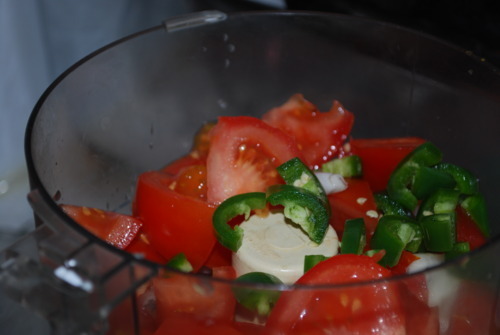 Put the onion, tomatoes, garlic, and jalapeno in your food processor. 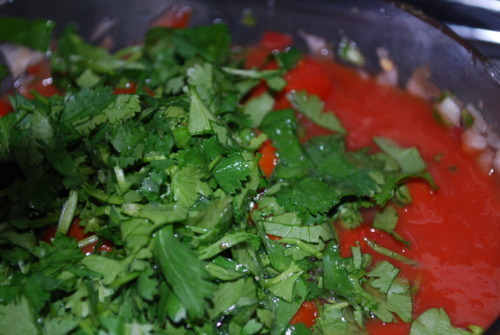 Add in the canned tomatoes, the cumin and the cilantro. Pulse that a couple times too. Add in the lime and a couple good pinches of salt. Pulse it until you get a nice consistency. Taste it and add more salt if you need. Then serve it up! That’s it!